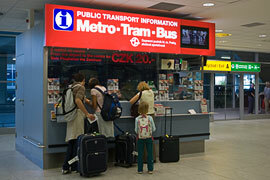 Taking public transportation is the cheapest way to get to and from the Prague airport. The ride costs 32 Kč (60 Kč on the Airport Express bus - see below) and the transit system is quite easy to use. Keep in mind that public transport may not have much space for luggage, can be crowded in peak times and most likely won't drop you off right at your hotel. If you have a lot of luggage, you may want to consider using a transfer service or a taxi. To take public transport, you will need a ticket for 32 Kč, which you can buy at the Public Transport Information booth at the airport or directly from the bus driver (he will charge you a little more). 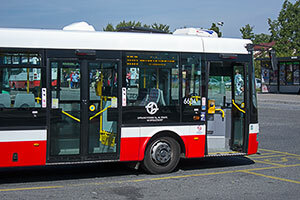 See our Tickets & Passes page for more information about Prague public transport tickets. For each piece of luggage larger than 25 cm x 45 cm x 70 cm (10 in x 18 in x 28 in), it is necessary to purchase a 13 Kč transfer ticket. Bus 119 runs between the Ruzyně Airport and Nádraží Veleslavín metro station (metro line A). This bus is the best choice if your destination is in the historical center of Prague (the Old Town, Lesser Town, New Town, Prague Castle area) or anywhere along line A of the metro including in the Vinohrady or Žižkov districts. The bus connections run every 7 to 20 minutes and the ride takes 13 to 17 minutes. Bus 119 leaves from outside the Arrivals terminal and runs from around 4.20 in the morning until around 11.45 at night. It will take you to the Nádraží Veleslavín metro station on line A. From there, you can take the metro using the same ticket to continue to your destination. The metro will get you to the center in no time (6 - 8 stops, depending on where you're going). The most popular metro stations on the route are: Malostranská - Lesser Town (Malá Strana), Staroměstská - Old Town (Staré Město), Můstek - bottom and middle of Wenceslas Square, Muzeum - top of Wenceslas Square. Take line A of the metro to Nádraží Veleslavín. Bus 119 leaves from near the station exit and runs from around 5 a.m. until around 0:30 at night. The airport is at the end of the line and the bus stops at all the terminals - 3 (private flights), 1 (flights to non-Schengen countries), and 2 (flights to Schengen countries). Announcements are made in English at the terminals. Bus 100 runs between the Ruzyně airport and the Zličín metro station (metro line B). Take this bus if your destination is near any of the metro stations on line B, such as in the New Town (Nové Město) or Smíchov districts. The bus runs every 15 minutes during the day and every 30 minutes after 7 p.m. The ride takes 15 to 20 minutes. Bus 100 leaves from outside the Arrivals terminal and runs from 5.45 in the morning until 23.39 at night. It will take you to the Zličín metro station, which is the last stop. From there, you can take the metro using the same ticket to continue to your destination. Once you get on the metro, expect the ride to take about 20 minutes (11 - 13 stops) to get you into the center. Some important metro stations on the route are: Anděl - Smíchov District, Karlovo náměstí - Charles Square, Národní třída - Národní Avenue, Můstek - bottom of Wenceslas Square, Náměstí Republiky - Republic Square, Florenc - main bus station. The Airport Express is a special bus that connects the Ruzyně Airport with the Main Train Station (Hlavní nádraží), which is on line C of the metro. The Airport Express bus is scheduled to coincide with the arrivals and departures of SuperCity (Pendolino), EuroCity and InterCity trains. A ticket costs 60 Kč and covers the Airport - Main Train Station route. 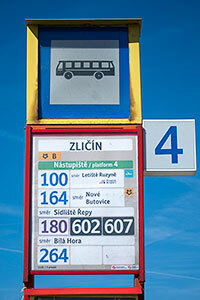 You can look up bus schedules at dpp.cz. As the airport stop, enter 'Terminal 1' or 'Terminal 2'; the terminals are only a few minutes apart from each other. Enter 'Nadrazi Veleslavin' (bus 119) or 'Zlicin' (bus 100) as the metro station to or from which you wish to travel. To see schedules and connections beyond that metro station, enter your destination or point of origin instead of the metro station. E.g. if you want to travel from the Prague airport to the Old Town Square, enter 'Staromestska' in the To field.